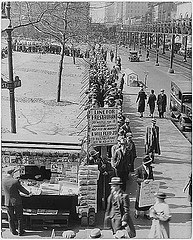 With all the talk of a coming US recession this photo of a depression era breadline should remind us that things could be a lot worse than they are likely to be here in the USA ever again. Here is a lot more about the US Depression at our travel and history pages. Following the crash in 1929, the USA continued to decline steadily into depression. Banks failed, leaving millions without savings. Factories locked up, shops closed, and most remaining businesses struggled. Governments faced great difficulty collecting taxes.